IN THE RACE FOR MAYOR ... [[MARION ON CAM]] TONI PRECKWINKLE PICKS UP A BIG ENDORSEMENT FROM CHANCE THE RAPPER. HOWEVER, EVEN THO PRECKWINKLE'S TEAM HAS LOBBIED FORMER PRESIDENT BARACK OBAMA AND MICHELLE OBAMA, THEY'VE MADE THEIR DECISION TO STAY OUT OF THE RUNOFF. [[ROB 3 SHOT]] POLITICAL REPORTER MARY ANN AHERN HERE WITH THE LATEST. CHANCE THE RAPPER HOPES TO IGNITE YOUNGER VOTERS. HE ENDORSED AMARA ENYIA IN THE FIRST ROUND AND NOW TURNS TO TONI PRECKWINKLE. [[NAT SOT APPLAUSE 05:06 MARY ANN: CHANCE THE RAPPER IS BECOMING A FAMILIAR FACE AT CITY HALL. THIS TIME HE'S HERE TO ENDORSE TONI PRECKWINKLE'S CAMPAIGN. CHANCE: "I'M FULLY BEHIND HER ... I'M FULLY IN SUPPORT OF HER." 05:12 MARY ANN; CHANCE SAYS HE'LL DEVOTE HIS TIME AND ENERGY, BUT AFTER GIVING $400 THOUSAND TO AMARA ENYIA'S CAMAPIGN ... DON'T COUNT ON ANY CASH. 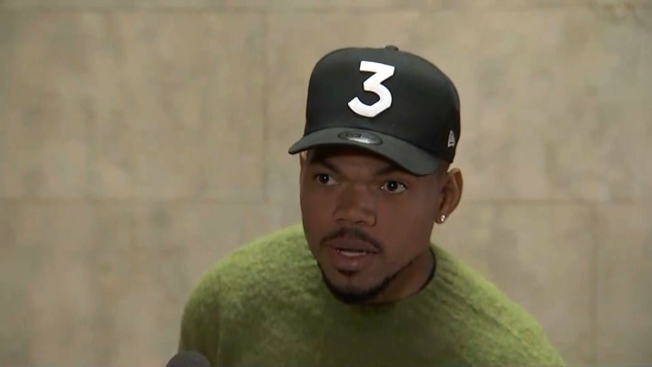 CHANCE: "I DON'T HAVE ANY MORE MONEY FOR CHICAGO POLITICS." 11:10 TONI "HE'S BEEN A CHAMPION ... MY CAMPAIGN." 01"16 MARY ANN: PRECKWINKLE EARLIER IN THE DAY DID NOT THROW COLD WATER ON QUESTIONS ABOUT LOOKING FOR AN ENDORSEMENT FROM BARACK AND MICHELLE OBAMA. 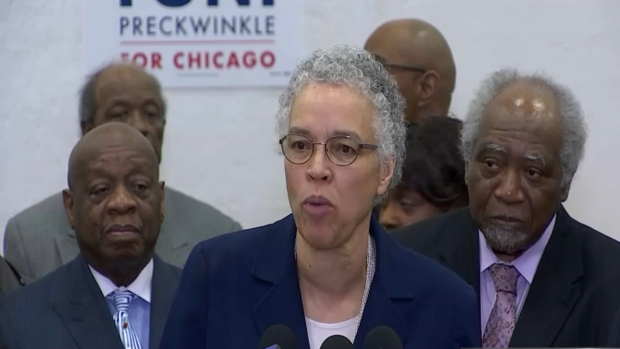 PRECKWINKLE: "I'M REALLY ... NEXT COUPLE OF DAYS." 01:43 NAT SOT OBAMA IN 2004 FROM HIS EARLY CAMPAIGN DAYS PRECKWINKLE WAS ONE OF OBAMA'S FIRST SUPPORTERS IN HIS STATE SENATE, CONGRESSIONAL, U.S. SENATE AND PRESIDENTIAL CAMPAIGNS. BUT THIS AFTERNOON -- AN OBAMA SPOKESMAN TELLS NBC 5 " THE OBAMAS DO NOT PLAN TO ENDORSE IN THE RUN OFF." ALDERMAN BRENDAN REILLY -- WHO REPRESENTS THE DOWNTOWN 42ND WARD HAS MADE HIS DECISION. HE'S SUPPORTING LORI LIGHTFOOT. ALDERMAN BRENDAN REILLY: "I THINK THE CITY ... LEADING PROPERLY." 02:44 MARY ANN: COOK COUNTY COMMISSIONER JOHN DALEY -- WHO WORKS ALONGSIDE COOK COUNTY BOARD PRESIDENT PRECKWINKLE -- IS ENDORSING HER. COOK COUNTY COMMISSIONER JOHN CALEY: "EVERYDAY ... PROTECTING THE TAX PAYERS." 01:10]] HIS FATHER KEN BENNETT HAS BEEN WITH THE PRECKWINKLE CAMAPIGN FROM THE START. AS FOR THE OBAMAS --THERE IS A LONG POLITICAL HISTORY BETWEEN THE FORMER PRESIDENT AND PRECKWINKLE. Chance the Rapper on Thursday endorsed Toni Preckwinkle for mayor of Chicago, just ahead of the city's runoff election. Chance made the announcement a 10 a.m. news conference at City Hall, calling her the most "qualified person in terms of somebody that's going to look out for all the people of Chicago." "In terms The person who’s going to account for the police, for victims of gun crime victims, of economic crime - it's Toni Preckwinkle. So I’m fully behind her," he said. Chance criticized Lightfoot, saying her history as a prosecutor "has not been in the best interest of black people of Chicago." Chicago will elect its first African American woman as mayor in the next two weeks. While the candidates are announcing endorsements and preparing for the final debates, many are questioning Toni Preckwinkle's strategy after not running any TV advertisements Tuesday. NBC 5's Mary Ann Ahern reports. Chance said he has "no more money" for Chicago politics, but pledged his time to campaign for Preckwinkle. The Chicago rapper first became involved in the mayor’s race when he endorsed Amara Enyia, who did not make it to the runoff. Chance has also joined protests against the new police and fire training academy approved by City Council last week. It was also announced Wednesday that Chance would be among the lineup for the Woodstock festival's 50th anniversary.